While it looks anything but, the W650 is one of Kawasaki's most recent designs. Launched in 1999 it uses the retro styling of Kawasaki's Wl, first built in the 1960s. Its air-cooled parallel twin engine has rounded cases and fins designed to recreate 30-year-old styling, and uses a bevel drive shaft to operate the overhead cam. The rest of the bike also harks back to the past. The fuel tank wears rubber kneepads, the low-slung silencers use a classic peashooter design, and the rubber fork gaitors and kickstart would almost convince the casual observer that this was indeed a bike from the 1960s. The W650 isn't totally devoid of modern components though. The engine has electric start, and the front disc brake is decidedly up-to-date. There Are Two constants in motorcycling that we take for granted. One, the British motorcycle industry lived and died on charismatic twins and singles (and, OK, the occasional triple) that stuck to mature technologies to the bitter end. Brit bikes are either attractively iconoclastic or rotting and unreliable old sleds, depending on your point of view and tolerance for warm beer. Two, the Japanese motorcycle industry lives and dies on the incessant march of technology-even if it's sometimes liberated from other places-and would rather turn to making beaded moccasins than appear to be behind the times. These are fine generalizations, facile and easy to digest, but they run increasingly against the grain. How's that again? Well, consider these two motorcycles as the levers that pry such preconceived notions right off the pavement. 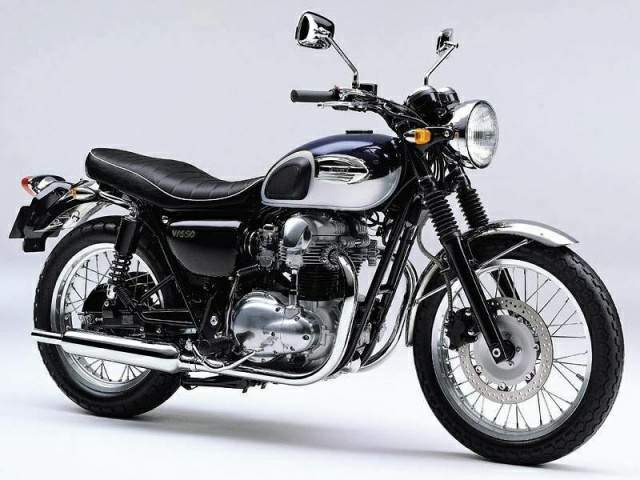 Kawasaki is hot on retro bikes-modern motorcycles designed to look and, sometimes, feel like old ones. Its Eddie Lawson Replica replica, the ZRX1100, is selling like saddlestitch jeans to adolescent girls. And there's no misunderstanding the inspiration for the deep-fendered Drifter cruiser; it, too, is rolling out of showrooms at good speed. Retros are well into fever pitch in Japan, so Kawasaki figured to try them here and is cautiously dribbling some into the States in limited numbers. Triumph has grasped its own history delicately between finger and thumb, selecting bits that are evocative but not precisely retrospective. Under John Bloor, the company has chosen to look ahead and make much more contemporary pieces. These converging paths lead to the Kawasaki W650 and the Triumph Legend TT: A Japanese bike that's convincingly British in character and performance, and a power cruiser from Hinckley that, for its polish and somewhat-anonymous styling, could well have Far Eastern roots. They share modest prices-$6499 for the W650 and $7699 for the Legend-and an acknowledgement that they won't be volume leaders. Think entry-retro. First things first. This is a Kawasaki, it says so right on the tank and seat, but it's trying hard, really hard, to be a 1960s Triumph Bonneville. 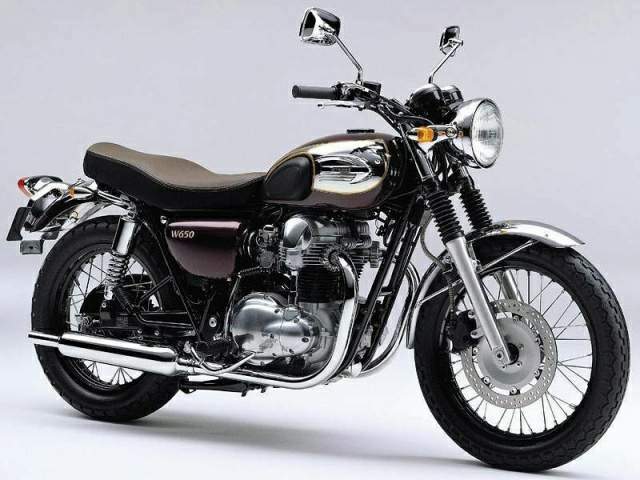 Yes, Kawasaki can honestly say that the W650 traces its roots to the firm's own W1 and W1SA parallel-twins of the late 1960s and early '70s; but those bikes were pretty shameless knockoffs of Brit models of the time. And that's the point. One ride on the W650 will drag you back, perhaps writhing and groaning, into the netherworld of 1960s moto tech. The bars are wide and graceful, and the bike feels quite small and light for a 650-even though, at 453 pounds wet, it's not exactly in need of eating-disorder counseling. (Do you remember your daddy telling you that a 650 was a big bike?) The hard, strangely shaped saddle (replete with white piping) places you high above the bike, perched as though on a barstool. It's an odd impression for riders used to stumpy, dense sportbikes to teeter atop a thin, tall motorcycle. And it works fine in the city, but at speeds on the far side of 70 mph the W650 quickly becomes tiring to ride thanks to a losing proposition of upper-body strength against aerodynamics. Look behind your right leg and, yes, it's a kickstarter! We seldom used the electric assist and got the 676cc parallel-twin chuffing on the first or second prod every time. At idle, the massively undersquare (72.0 x 83.0mm) air-cooled twin thrums almost silently and barely raises its voice when being thrashed. Despite having four valves per cylinder actuated by a single overhead, bevel-driven cam, the W650's powerplant produces only modest power-44.8 hp at 6750 rpm. At least the 360-degree-crank engine-both pistons rise and fall together-carries its torque well, staying above 35 foot-pounds from 2000 to 6500 rpm. Thanks to 34mm CV carbs fitted with a throttle-position sensor and an accelerator pump, the engine is reasonably responsive, seeming only to work against a lot of flywheel effect.